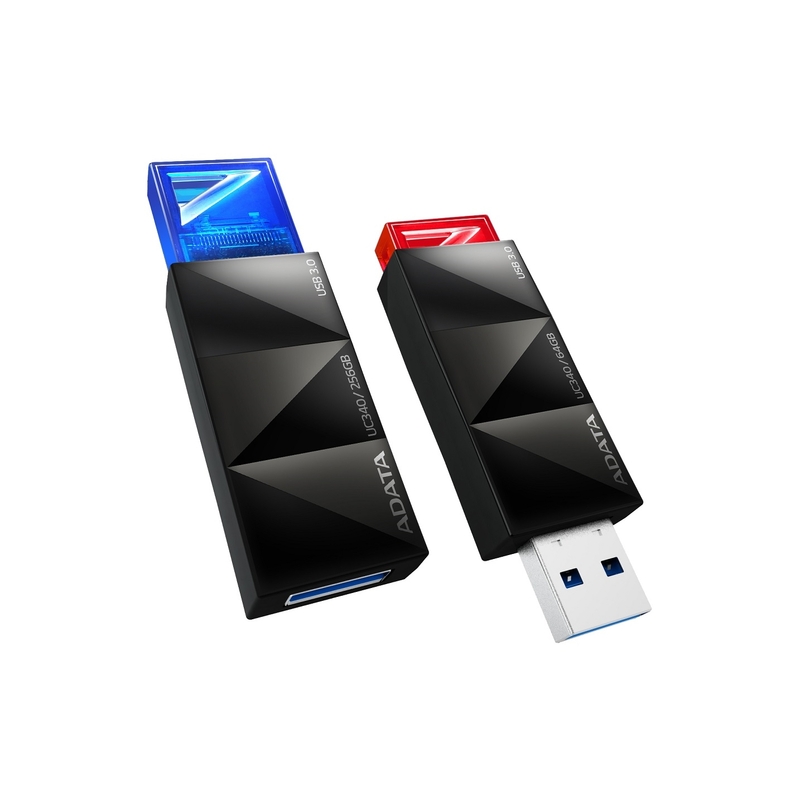 Taipei, Taiwan – December 15, 2014 – ADATA™ Technology, a leading manufacturer of high-performance DRAM memory modules and NAND Flash applications, launches a new UC340 USB 3.0 flash drive. 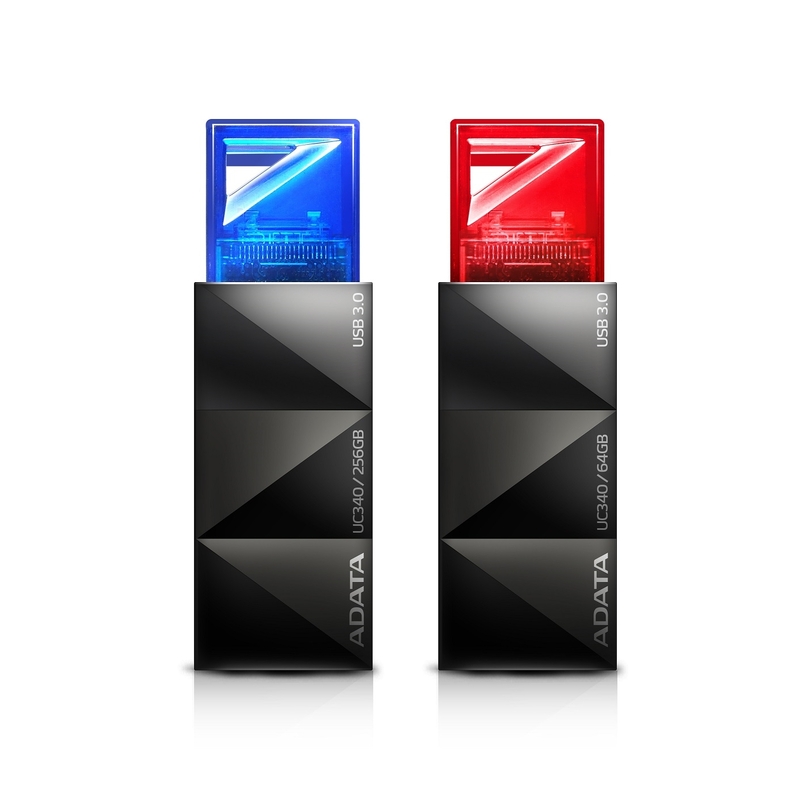 The Choice UC340 flash drive features trim geometric lines and a clean glossy finish. Carry it on a neck strap, purse, or key chain. With SuperSpeed USB 3.0 connectivity, you can transfer anywhere between 16GB to 256GB of audio, video and data files in just a few moments. Just push-to-click the colored head to extend the USB connector. Push again to retract it. The UC340 is a work of utterly elegant geometry. Multiple black triangular facets on its casing complement a brilliantly colored translucent body. Not a mere storage drive, it embodies the best in performance and quality within the classic lines of fashion. Simply click the USB head to extend and retract the connector quickly and easily. With no end cap to hassle with or lose, the UC340 is both convenient and easy-to-use. An amply large triangular lanyard hole matches the US340’s classy geometric design. Carry it on a key ring. Wear it on a neck strap or bracelet. The UC340 comes in sizes ranging from 16GB to 256GB, and features the USB 3.0 high-performance SuperSpeed transmission standard. With read and write speeds up to 200/120 MB/s, enjoy quick transfer speeds that reduce the time you need to move your video, audio and document files. With ADATA’s Choice UC340 flash drive, you can experience an elegant balance of style and utmost practicality. Additionally, purchasers of USB flash drives are entitled to download ADATA’s free “UFDtoGO” and “OStoGO” software as well as enjoy a lifetime warranty backing up great mobility and convenience. The UC340 is available in capacities of 16, 32, 64, 128, and 256 gigabytes. The UC340 will be available through selected retailers and distributors, at a MSRP of AU$12.50 / NZ$14.24, AU$20.70 / NZ$23.60, AU$36.63 / NZ$41.76, AU$89.23 / NZ$101.73 and AU$192.37 / NZ$219.34 respectively.